Yesterday I chatted it up with our friendly neighbor next door. She described her green thumb plans for the goodies they hope to plant in their garden patch. Meanwhile, I gazed upon our row of winter-weary empty flowerpots! While considering this question, I've discovered three key points for a potential military homebuyer to consider: finances, timing, and maintenance. Unlike paying rent to a landlord, if you're paying into a mortgage, you're investing in the future. 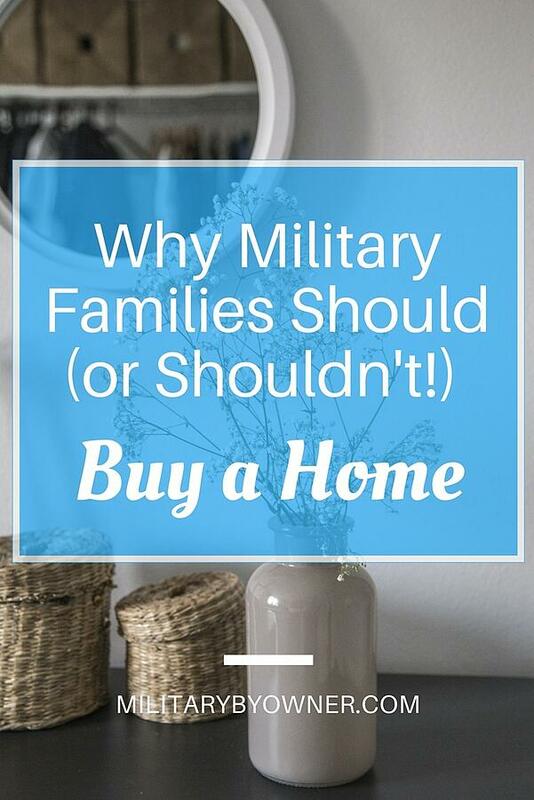 With a variety of home loans available, a military family can shop around for the best mortgage for their budget and discuss options with their choice of lender. and having a healthy reserve of cash for whatever else may come up. While building a nest egg for an abode to call our own, we’ve chosen to use our Basic Allowance for Housing (BAH) towards a rental. With appropriate financing, a military member can embrace the opportunity to become a homeowner. While saving money for a future real estate purchase, it can make sense to rent. When friends of ours bought a home near Maxwell Air Force Base, we wondered why they’d choose to buy when only spending a year at a school in Montgomery? Although they’ve since moved away, their home is tucked in the middle of the popular Deer Creek neighborhood and has been consistently rented by other military families. A local property management company maintains their residence, allowing our friends to continue to build equity with each passing year. As luck would often have it, military families often receive orders shortly after a home purchase! If you're a homeowner who wants to keep their house, MilitaryByOwner offers an abundant amount of helpful information to guide you through becoming a landlord and listing your home for rent. There’s a reason why our friendly neighbor plants a good swath of garden each season-- they are going on eight years of being stationed here. Having moved 6 times in 8 years, clearly my spouse hasn’t found that “golden ticket” to staying put! 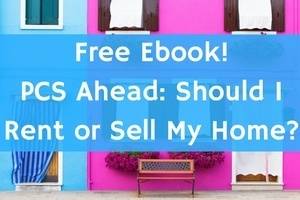 If an assignment came along that kept us in place, we too could put money down on our own casa. Until that glorious day, short-term homeownership is not ideal for our spontaneous military life, and so we continue to rent. If you're a military member shopping for a home, browse listings on MilitaryByOwner and reviews on Military Town Advisor for popular neighborhoods. Buying a home in an ideal location can ease the process of finding a tenant when it’s time to PCS. Have orders for short-term training and prefer to rent? Check the military clause before signing a lease. If you own the home, customizing it to your liking is easy. With ever-changing technology and green initiatives, a homeowner can deck out their abode with energy efficient improvements. Adding solar solutions or smart home features will not only save on utilities, but may be eligible for a tax deduction. With the weather slowly warming up, the other day I turned on the in-ground sprinkler system for a test run. Zones 2 and 3 were perfect, but when the sprinkler reached Zone 4, an epic geyser erupted! Quickly turning the system off, I promptly called the landlord to explain the sudden appearance of a fountain of water that rivaled Old Faithful. If this rental was our property, we’d have another pressing project on the “honey do” list. Owning a home requires quite a bit of upkeep. The seemingly endless list of chores places demands on a person’s time. Often, a military member may already have their time taken up with a deployment, TDY trips, or simply long days at work. Additionally, fix-it projects are often expensive. No matter if it’s a routine replacement or an unexpected repair, the ole budget needs plenty of wiggle room to cover maintenance expenses. Owning their own property, a military member has the freedom to make improvements that add to their quality of life or potentially preserve the environment. Before signing a lease, a military member can clarify contact information with the landlord and how repairs and maintenance of the rental will be handled. ...then they might as well follow the homeownership dream. Homeownership can provide a military family a sense of stability amidst this ever-changing military lifestyle.